Asimov’s Science Fiction Magazine, April 1983. Cover art by Marc Yankus. In 1983 I was still attending a community college part time while working several part-time jobs, stuck in a weird financial situation too complicated and frankly boring to go into right now. The important points are that I was still very closeted and in a situation where I was dependent on conservative religious relatives and equally conservative institutions for my livelihood. I clung to science fiction and fantasy as a half-drowned person might clasp the last floating piece of wreckage after a boat disaster in the middle of the ocean. And while I couldn’t always afford to buy new sf/f books and anthologies when they came out, the local public library subscribed to three science fiction magazines, one of which was Asimov’s Science Fiction Magazine, so a few times I month I would spend an afternoon at the library reading those magazines. And it was in the pages of the April 1983 issue of Asimov’s that I first met Connie Willis. 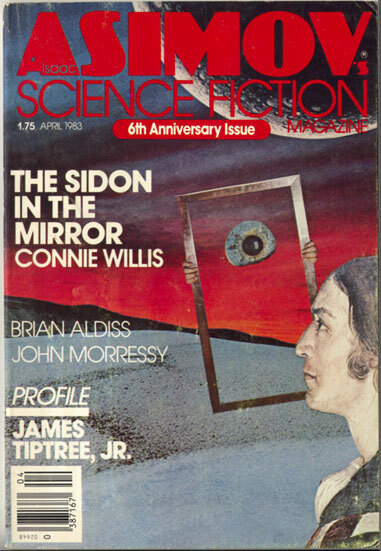 The novelette included in that issue, “The Sidon in the Mirror” is told from the point of view of person just arrived on a new planet. Except it isn’t a planet. Paylay is a dead star, and somehow humans have figured out how to live on a solid crust of the outer layers of the dead star. It isn’t a terribly nice place to live, but large pockets of various pure elements can be mined, so people have an incentive to come there. A side effect of the mining process has created a thin layer of mostly breathable air that is much higher in helium and hydrogen that ours is. We learn that our viewpoint character is not human, but rather a Mirror: an alien species that has the ability to absorb personality traits, skills, and other things from other beings. They don’t take on the shape of the copied person, and the process is totally involuntary. Mirrors don’t even know they are copying, their personality being re-written as they go, unless someone else notices and tells them. There have been some instances in the past of Mirrors absorbing the murderous thoughts of others and acting on them, so they have been banned from various world. He’s been brought to this strange mining colony to play piano in the colony’s only brothel. He had previously absorbed the piano playing skills of a now dead man who was known to both the other of the brothel and at least one of her employees, which is at least part of the reason he was brought to Paylay. The rest of the plot is difficult to summarize, in part because Connie does a really good job of putting you inside the head of the person who doesn’t know or trust his own thoughts and motives. He is afraid he is going to be compelled to do something horrible, and there are characters he is now living among who appear to be trying to manipulate who he copies for their own nefarious purposes. But I should explain the title. The viewpoint character’s species are called Mirrors, as explained. There is another alien creature mentioned, it’s called a sidon. Sidon’s are vicious predators, but some people have tried to tame them (because people will do that), and it has always gone badly. The miners have taken to naming their mining taps as sidons—while all the compressors and pipes and such are holding, everything seems under control. But ever miner knows it is only a matter of time before a tapped sight explodes. They’re just all trying to make their money and leave before that happens. By the end of the tale there are violent deaths, and it is left to the reader to decide which of the deaths were murder, which were self-defense, or whether they fall into another category all together. On one level the story is about the meaning of free will. Willis herself has said, when introducing the story in collections of her work, that the story was inspired to seeing stories of twins who were adopted out separately, and then find each other as adults and learn how many things about their lives are spookily similar. Many things we think of as choices may not be at all. If was a tough story to read, because there were points in the tale when I wanted the viewpoint character to do something different. I saw moments he could have escaped the trap. Except when I got to the end, I found myself questioning the definition of trap I had been using. Was the trap the manipulation coming from one of the two characters who were trying to turn the Mirror into a killer, or was the trap the Mirror’s own belief that he himself would inevitably turn into a violent killer, or was the trap the fear of the other characters? I’ve re-read the story many times over the years. And even though I know how it ends, I’m always at the edge of the seat throughout. As mentioned above, Willis really puts you in the mind of this character so that by the middle of the story, I’m just as afraid and uncertain as to what will happen as the character is. The story made me think a lot about how we make decisions. How much of what we feel is the result of what people expect us to feel? How many decisions that we think are our own are being forced upon us? What, exactly, is the nature of our own identity? They were questions I was wrestling with personally. While I didn’t have an sudden epiphany at the end of the tale, it did nudge me further in the direction of coming to understand how the nature of the closet. The stifling social trap that many queers find themselves living in is constructed at least as much by our desire to win the approval of society, family, and even my closest friends. It isn’t just fear that drives one into the closet, but also (ironically) the need for love. And it took an alien playing piano on the surface of a dead star to show me that.